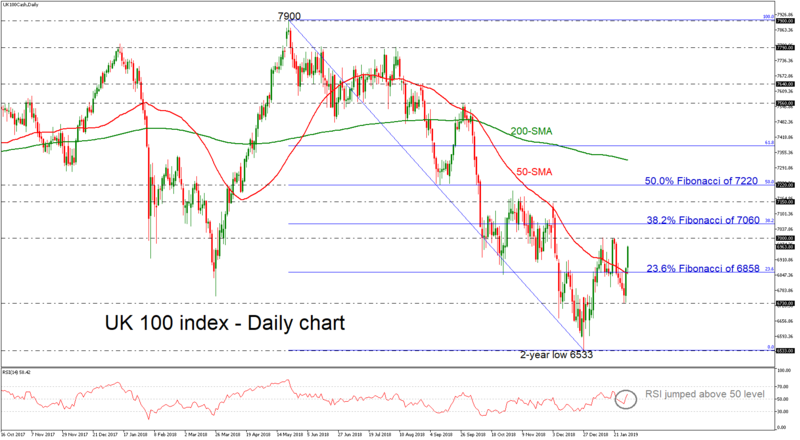 UK 100 stock index (FTSE 100) is set to record another strong green day, surging above the 50-simple moving average (SMA) and the 23.6% Fibonacci retracement level of the downleg from 7900 to 6533 around 6858 in the daily chart. The RSI now suggests that the market sentiment might get better as the index is moving in the positive territory. If the price manages to continue bullish actions and surpasses the 7000 level, the 38.2% Fibonacci retracement level of the downleg from 7900 to 6533, around 7060 could come in focus. Further up, the index could rest around the 7150 level as it did in early December, while a violation of this point may shift attention towards the 7200 resistance, which overlaps with the 50.0% Fibonacci mark. However, should bearish dynamics dominate, the market might revisit the 23.6% Fibonacci of 6858 before falling towards the 6730 support, taken from the latest lows. Below that, the price could hit again the key level of 6533. Overall, the downfall from 7900 is still active and hence the outlook remains negative despite the short-term upward rally.